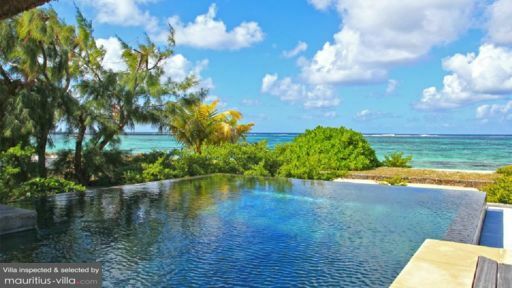 Villa Lafayette is the perfect 5-bedroom holiday retreat for families wanting to stay somewhere authentic yet luxurious right on the gorgeous East coast of Mauritius in the peaceful village of Poste Lafayette. You can enjoy wonderful afternoon walks along the sandy shore or visit one of the island’s national parks. For some sightseeing and souvenir shopping, drive down to the islands capital Port Louis or to Grand Baie, the island’s most happening beach resort destination. The beautiful wooden master suite is tucked on the first floor. The room features a stunning king-size four poster bed beneath the high soaring traditional roof, a private en-suite bathroom and a dressing space. The four guest bedrooms, one fitted with a king-size double bed and three with twin beds are found on ground level. These four bedroom are fully air-conditioned and they share two bathrooms together, perfect for families. A tropical alang-alang roofed pavilion with rough river-rock walls wraps around the charming private garden of villa Lafayette. The garden stretched out all the way to the golden sandy shore and the azure blue ocean where you can swim and gaze at the rich marine life with your snorkeling set. 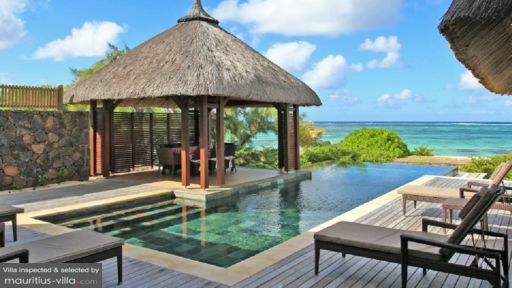 In the heart of the garden, encompassed by a timber deck, lies the sparkling infinity swimming pool, inviting you to jump in on the spot before relaxing on the pool-side sunbeds, catching that gorgeous tropical tan. The living room is designed elegantly with colourful paintings on the walls, chic red curtains and a teak interior design featuring a formal dining table and lounge corner tucked with plush red pillows. 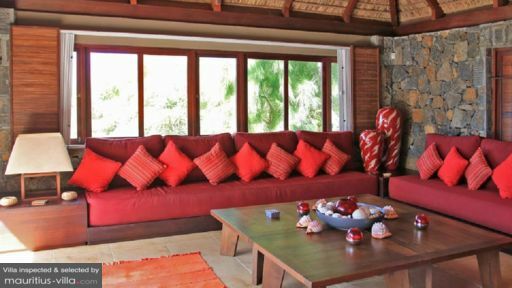 For the lovers of a tropical life, there is an alfresco poolside dining bale overlooking the ocean and a pool-side open-plan living space furnished with a super comfy red cushioned sofa where you curl up with a book or watch movies together on a cosy family evening. The villa is staffed with housekeeping, a cook and a security guard, making your stay even more pleasurable.